Today we are extremely excited to offer our inaugural release of Insignia, the famous Napa Valley Cabernet from the historic Joseph Phelps winery in California. Joseph Phelps’ Insignia is one of the truly great iconic Napa wines, capable of appealing to almost all wine lovers, embodying a Bordeaux style with Napa flair. In 2012 they have made one of their greatest ever wines, reflected in its potential 100 point score from Robert Parker. Insignia is a true Bordeaux blend incorporating all five varietals, the 2012 Insignia is 75% Cabernet Sauvignon, 10% Petit Verdot, 10% Merlot, 3% Malbec and 2% Cabernet Franc. Parker rated the 2012, 96-100 points and given the price, this represents amazing value for such a revered wine. 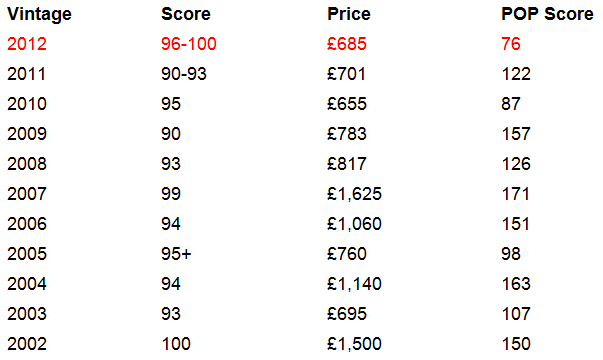 The 100-point 2002 already retails for £1,500 per case of six bottles – if you are lucky enough to locate them! At £685 per case for the Insignia 2012, we think this is a fabulous opportunity not only for those who wish to consume this delicious California Cabernet, but for those looking to invest as well. At today’s first release price, a 96 point score would make the 2012 undervalued, however, the 2012 vintage is one of the greatest ever and we expect Parker’s final score to be pushing, if not 100 points, which will see the wine double in value. Compare Insignia 2012 with the 100-point Screaming Eagle which retails for £4,900 per case of three or the 98-point scoring Scarecrow, which retails for £325/bottle and the Insignia is even more compelling; it is a high-end California Cabernet which doesn’t break the bank. Since 1974, Insignia has been produced in every vintage; in the early years Phelps purchased fruit from other independent growers but since 2004 100% of the fruit has come from his own estate. Joe’s son, Bill, now runs the winery, with Ashley Hepworth – a talented young winemaker who earned her stripes at Ch. Angelus in St. Emilion before working at Joseph Phelps – continuing the legacy of producing world-class wines and earning praise from both Robert Parker and Antonio Galloni. ‘Joseph Phelps’ flagship wines include the incredibly ageworthy Insignia. The 2012 Insignia Proprietary Red is composed of 75% Cabernet Sauvignon, 10% Petit Verdot, 10% Merlot, 3% Malbec and 2% Cabernet Franc, all aged 24 months in 100% new French oak. The vintage was of such high quality and quantity that 17,500 cases were produced. A magnificent Insignia that will be bottled in several months, it boasts an opaque purple color as well as fabulous notes of graphite, blackberries, blackcurrant liqueur, camphor, barbecue smoke and spice box. Rich, full-bodied and opulent with plenty of tannin and structure lurking beneath the extravagant generosity of fruit, this stunning 2012 should drink well for 25-30+ years.